Though kickoff for this week’s big game between the New England Patriots and Los Angeles Rams isn’t scheduled to occur until 6:30 p.m. Eastern on Sunday, Feb. 3 in Atlanta’s Mercedes Benz Stadium, the Georgia Department of Transportation, the Metropolitan Atlanta Rapid Transit Authority, and other public agencies have been hard at work for several years to prepare the city’s transportation conduits – from Hartsfield-Jackson International Airport and MARTA’s light-rail line to the surrounding highways – to handle an expected influx of more than a million visitors. “Georgia DOT has been working closely with the City of Atlanta, the Super Bowl Host Committee and all of the contributing offices and agencies to prepare for the Super Bowl LIII for the past two years,” Georgia DOT Commissioner Russell McMurry said in a statement Jan. 28. “A major part of our preparation is the understanding that there would be a possibility for winter weather during the 10-day period leading up to the big game, and we are ready to handle whatever comes our way,” he explained. “During this period and at all times, Georgia DOT is committed to clearing our roadways and keeping our transportation system as safe as possible for residents and guests visiting Atlanta for the festivities,” he stressed. Statewide, Georgia DOT said it “stands at the ready” with approximately 1,900 employees on call, 54,030 tons of salt, 65,460 tons of gravel, storage capacity for 900,000 gallons of brine, and more than 420 pieces of snow removal equipment should foul weather strike during Super Bowl weekend. Georgia DOT officials added that the agency is also deploying designated teams, including increased staffing of Georgia DOT’s HERO and CHAMP teams, to respond to specific types of incidents as needed during Super Bowl weekend: brine distribution teams dispensing brine before and during a winter weather event; interstate teams with snow plows and material spreaders treating the interstates around metro Atlanta; special response teams to specifically address conditions as they arise; and traffic strike teams consisting of employees from Georgia DOT and other state agencies to focus on clearing incidents on major interstates and roadways in metro Atlanta. The city of Atlanta also put its snow removal forces on alert during the week leading up to Super Bowl LIII, with festivities kicking off Jan. 23 and wrapping up with the game on Feb. 3. Atlanta Mayor Keisha Lance Bottoms noted in a statement that the city’s public works department is equipped with seven brine units, 10 spreaders, 15 all-terrain vehicles, 24,000 gallons of brine and 3,400 tons of salt, with contractor support “on standby” as well. “As a city, we have worked to ensure the Super Bowl is the People’s Game,” she said. “The events throughout Atlanta will bring the festivities into the heart of all of our communities.” Mayor Bottoms added that the city also created a dedicated website for Super Bowl week as well. 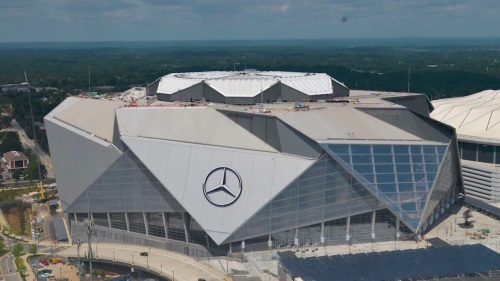 The Federal Aviation Administration also made the airspace around Mercedes-Benz Stadium a “No Drone Zone” for Super Bowl LIII, starting three days before the game on through the completion of the Super Bowl on Feb. 3. The FAA will establish a Temporary Flight Restriction or TFR on game day that will prohibit drones within a 30-mile radius of the stadium up to 17,999 feet in altitude from 5:30 to 11:59 pm, Eastern Time, on Feb. 3. Meanwhile, the agency restricted drone flights for one nautical mile around the stadium up to an altitude of 1,000 feet beginning on Jan. 31 through Feb. 2 from 10 a.m. to 11:59 p.m. Eastern Time, and on Feb. 3 from 10 a.m. to 5:30 p.m., at which time the TFR for the game takes effect. Pilots and drone operators who enter the TFRs without permission could face civil penalties that exceed $20,000 and potential criminal prosecution for flying drones in the TFR, the agency noted in a statement.